In his book "Web Analytics an hour a day", Avinash Kaushik mentions the importance of qualitative analysis of our site’s metrics and elements. Understanding the reasons of our analysis allows us to incorporate the "voice of our customers" (VOC) in our decision making process and carry out improvement actions based on user interaction with our website or landing page. "User-centered design (UCD) is a type of user interface design and a process in which the needs, wants, and limitations of end users of a product are given extensive attention at each stage of the design process. UCD tries to optimize the product around how users can, want, or need to use the product, rather than forcing the users to change their behavior to accommodate the product." But why to design thinking of your customers? Simply because they are the ones registered on your site, talking about your brand, seeking to meet their needs, and primarily because they are the ones who buy your products or services! They got the money, They got the power! If the decision-making lost the customer satisfaction as center is likely that short-term results will end in a loss of time, energy and of course, money. How to make a user-centered design? 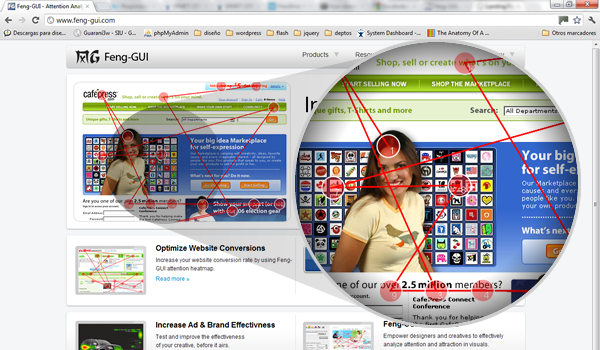 Makes a simulation of human vision during the first 5 seconds of exposure and predicts the visual way that would make the user on our site. The best value for your money. Allows to make a heat map of the site, knowing the elements that receive the largest number of clicks and to segment them by type of user, source, keyword, etc.. The most complete tool on the market. 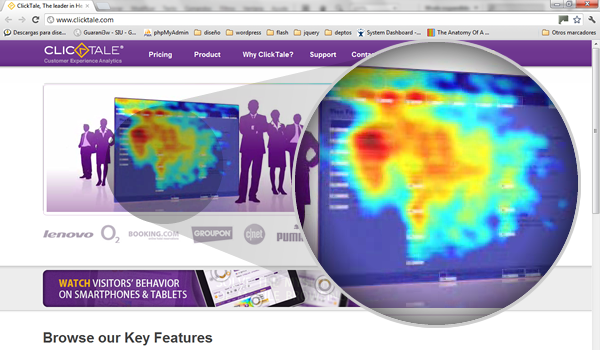 Make a recording of user activity and get heat maps related to attention and clicks on the site. Allows creation of funnels and has a high level of segmentation. Design for users helps us understand the the main reason of our site or landing page and with them make better decisions about our business. Be empathic, understand your target audience, measure, test and start boosting your landing pages' conversions.